Available to Order. Estimated delivery is 21/06/2019. Alesis has updated its catalogue with some new, affordable controller keyboards. 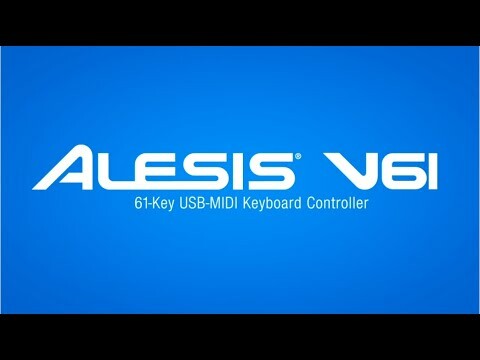 Even from a brand with a reputation for incredible ‘features-per-pound’, the Alesis V61 sets a new precedent for value. Essentially, the V61 is a USB MIDI controller keyboard. As the name probably suggests, this is a 61-note device, being equipped with 61, full-size, semi-weighted, velocity sensitive keys. This means that the keys are of the same size that you’d expect to see on a piano, and they are sensitive to differences in dynamics- that is, if you press the keys softly, the resulting sound will be soft, and when you press them harder, the resulting sound will be louder. This gives it the kind of dynamic expression you might expect from an acoustic piano. The keyboard is matched with a selection of other controls aimed at the modern, computer-based musician. On the panel to left of the keyboard, there is a pitch bend wheel and modulation wheel that can be assigned to control anything from vibrato to filters and effects. Below these are eight trigger pads. These are backlit with blue LEDs, making them very visible, and are also velocity and pressure sensitive. Pressure sensitivity means that when holding down the pad, they respond to any changes in pressure. This can be particularly useful for expressive volume changes. To find any trigger pads on a keyboard at this price-point is surprising, but to find pads that are velocity AND pressure sensitive is incredible. Above the pads, mod and pitch wheels are four assignable rotary controls, and four assignable buttons. Whilst the computer studio has provided producers with power and flexibility beyond their wildest dreams, controlling effects, mixers and instruments other virtual devices with a mouse is not the most intuitive or inspiring experience. This is what assignable controllers are for. They can be set to control MIDI parameters from within music software, providing physical hands-on control. The Alesis V61 punches way above its weight in this price bracket and gives you total control over your favourite digital audio software.